We’re all burning on this day in late April, when the sun has finally risen from the long bitter winter. None of us fully trust that these three afternoons tipping sixty-five are going to last. That the worst is over. We’re all pink-cheeked, as though we New Englanders, collectively, forgot what the sun can do to our skin, when we put ourselves out into the world, directly, fearlessly, face to sky. I thought we were just flushed at first, my three boys and I, out of shape and huffing along a trail that has wound us through a mile or two of wooded forest. I found the path on my phone, on an app that downloaded when I, on a whim, said, you know, it’s a nice day, get your shoes, we’re going out for a hike. And then I had to figure out where, exactly. We live in a city, our front yard is a main street, the back is a parking lot that fills with the cars of commuters who carpool down to Boston. The woods will be good. Last spring was unseasonably warm. I remember opening the windows in the hospital room in mid-March and asking the nurse if there was a fan we could borrow to keep the air moving. Hospital air, sick air. Air you want to find its way out. When we reach the peak, the boys run ahead of me, even Evan, who’s only five. His legs move double time, his curls catching light and blowing in the breeze. I hang back at the forest’s edge and watch them. Five, seven, nine. Our perfectly spaced out trio of boys. They are three bright copper redheads with packs larger than their narrow backs, standing at the edge of the world. I didn’t expect to be alone. On the day we said our vows, or when I was giving birth to one, two, three children. Three boys, who are an alien species to me, who bicker and wrestle and can’t eat beans without fart jokes. I didn’t expect to be alone, to raise them without an interpreter. But then, we never were good at planning and there you went, on that August evening when the world seemed to crack irreparably. I heard footsteps and clipboards and chatter at the nurse’s station. I heard someone filling a bucket with crushed ice out in the hall. I heard every indication that nothing was wrong or different for anyone, except me. I was with you, and then I wasn’t and I stared at your unchanging face until they made me leave. Huddled together, looking out at the horizon, there’s a strange yearning, an ache. In the distance are the White Mountains. Between them and us, a region of lakes, miles of naked trees still waiting for buds after this never-ending winter. Melanie Haney holds an MFA in creative writing from Lesley University. Her fiction has appeared in Family Circle magazine and various literary magazines including Fifth Wednesday Journal, Blue Earth Review, Relief, the ELM, Quality Women’s Fiction, Berkeley Fiction Review, Clockhouse, the Hemginway Shorts and others. 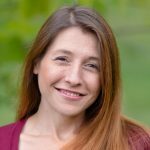 She currently lives in New Hampshire, where she is a photographer and mother of four creative kids, and she documents their adventures at www.thefrozenmoon.com.